This summer, something will be glowing in Queens. An installation dubbed “Cosmo” is on display at PS1, the Museum of Modern Art’s hip Long Island City art outpost through September 7th. The network of spindly hoops, tubes and holding tanks circulates 3,000 gallons of water through a series of purifying ecosystems until it’s clean enough to drink. Over the next few weeks, phosphorescent microorganisms highly sensitive to water toxicity will grow in the tubes until the whole structure glows in the dark. “Cosmo” was the winner of MoMA’s 2015 Young Architects Program, a contest in which emerging architects design a temporary outdoor installation for PS1’s courtyard that uses the elements of shade, seating and water and addresses environmental issues. Designer Andrés Jaque, architect and director of the New York- and Madrid-based Office for Political Innovation, says his artful filtration system addresses the way society relates to water, a resource increasingly scarce, politicized and at the heart of global conflict. “Cosmo,” by contrast, places a precious resource squarely in the public sphere, making clean water an aesthetic spectacle and a meeting point. MoMA and other art institutions can be catalysts, says Jaque, creating spaces for experimentation and dialogues that bring urban issues in touch with a wider audience. The installation is made from simple parts, most of them easily acquired, so it could be replicated at any scale, nearly anywhere: at home, on a balcony, in a classroom, in settings urban and rural. 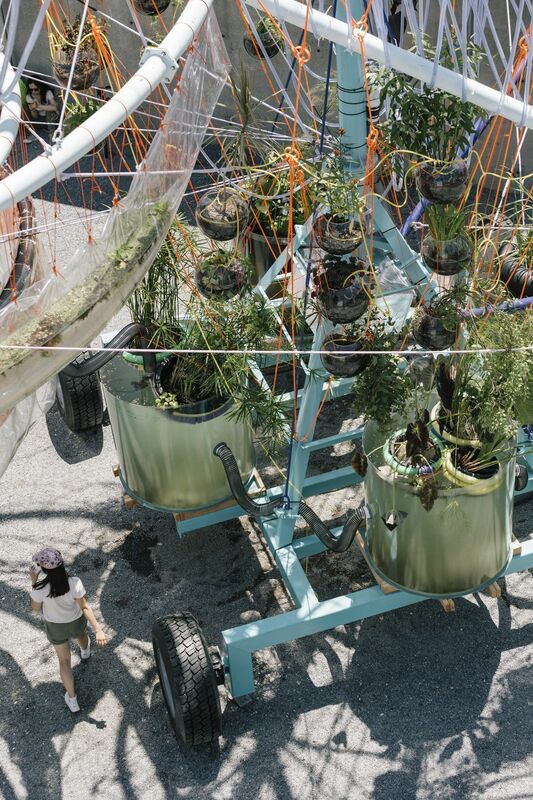 At the PS1 prototype, water provided by New York’s EPA circulates first through a wetland ecosystem, where sediment is removed. Then it is exposed to the sun in clear tubes, where UV rays eliminate bacteria. Next an algae bath removes nitrogen and phosphates, and finally the water is sent into a cascade to increase diluted oxygen. At the end of one cycle, about four days, the water is pure enough to drink. The glowing microorganisms are actually the potable proof; they only grow in water that’s safe enough for people to drink. No sophisticated sensors to test water quality required. “That’s actually our main interest, creating something that can have a life of its own,” says Jaque. He and his team created a “Cosmo” app that shares their technique for free. Already, he has heard from a Harlem group working on a Cosmo-style system for a garden, and another that wants to recycle rainwater in Chile. The Office of Political Innovation, says Jaque, focuses on how the built environment encourages certain behaviors over others. He thinks architects and designers should consider how to make positive social outcomes not only more accessible, but also more alluring, more fun.